So, this is the Kristiine part of my trip in 05.03.2006, the Mustamäe part is post 007. 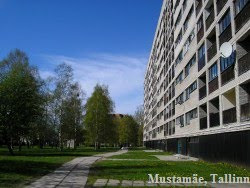 These buildings and Mustamäe buildings are separated with an area of low private houses, 2 or 3 busstops. I quite like these buildings, this area is like a continuation of Mustamäe, although it contains buildings which are also present in Lasnamäe and Väike-Õismäe. And there are unique blockbuildings as well. The backside of this building. Lots of these in Väike-Õismäe and Lasnamäe. This is a very long building, some 10-12 doors or so, I think it is Välja street (Field street). A typical school, renovated though. That's unique: 9 floors and windows on the side. This one reminds also Väike-Õismäe.